Sophisticated jazz trio featuring saxophone, guitar and double bass - perfect for weddings and functions. 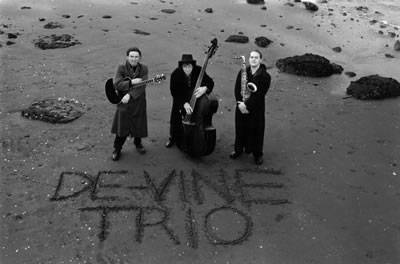 De vine Trio play a wide variety of instrumental jazz standards, bebop, ballads and bossa nova. The experienced and talented musicians in De Vine Trio have entertained guests at weddings and functions for over 8 years. A variety of jazz standards, bop and ballads that’s suitable as background music for your event, but engaging enough for those who’d like to hear some great jazz. 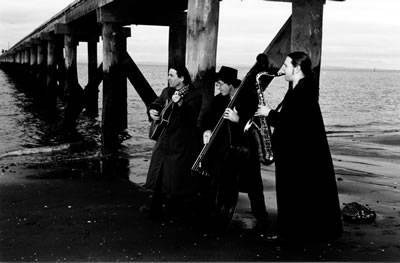 Featuring Ben McNicoll, tenor/alto/soprano saxophones; Lance McNicoll, guitar; and Peter Scott, double bass. De Vine Trio are self contained, needing only 1 power point for their instrument amplifiers and approx 2.5m x 3m space to setup. A PA can be supplied for larger or outdoor venues on request. De Vine Trio can perform without amplification as a strolling trio for outdoor venues. I just wanted to pass on a massive thank you to the De Vine Trio, they were absolutely amazing; great music and happy to fit with what we were doing, and perfect for our wedding. We had lots of compliments from our guests to pass on too. ".... a very big thank you from me and the team. Your band were fantastic last night, the perfect accompaniment to our event." "I would like to thank you for recommending Devine Trio. They were fantastic! ... a great performance from the band that our residents and clients are raving about! The volume was perfect and the music created a really nice vibe." Many thanks for this recommendation. We really enjoyed the band, very professional, easy setup, relaxing music which also allowed people to talk so made for a fantastic evening. Would recommend them as a band! I thought the band did a great job throughout the night. They were very professional. Hope they enjoyed our wedding as much as we did. Also thank you for your kind help throughout this year in organising this event.